Elevator protection is essential to a safe working environment. When on a construction site, the elevator entrances on each floor are open, presenting a fall hazard to the worker. In order to prevent falls into the elevator shaft, guardrails and curtains must be implemented to each entrance for the worker’s safety. These implementations must be compliant to OSHA standards and be relayed to every worker on the site. According to OSHA 1917.116(f), elevator landing openings shall be provided with doors, gates, or equivalent protection which shall be in place when the elevator is not at that landing, to prevent employees from falling into the shaft. Falls are the leading cause of death among construction workers, and elevator protection is a vital step in ensuring the construction site is safe for work. Elevator protection not only protects workers from falls, but also protects the integrity of the elevator itself. During construction, elements of the job such as dust and debris are a constant hazard to the health of the worker. These hazards can appear in the elevator, with dust and debris making their way into the shaft. The dust and debris can accumulate over time, compromising the integrity of the elevator shaft and posing a future hazard once construction is complete. To prevent this, elevator curtains are implemented during construction to enclose the openings to the elevator shaft. 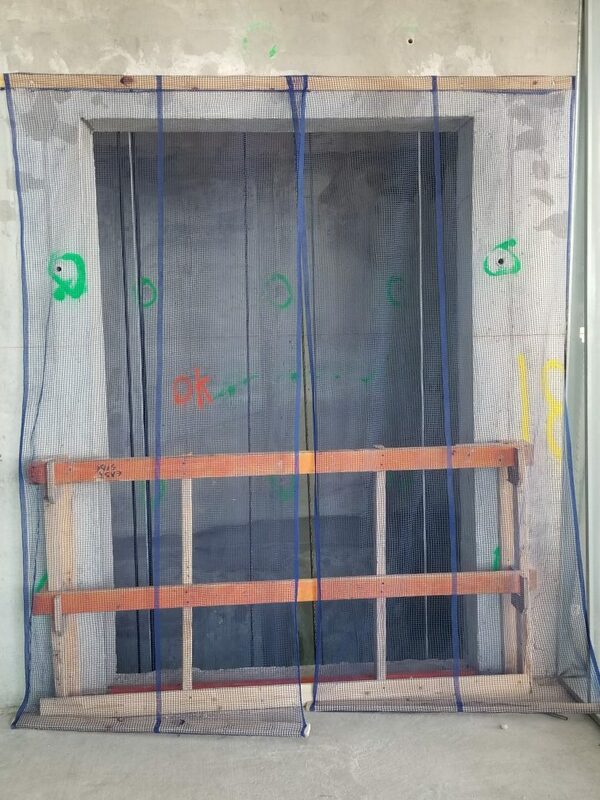 The curtains in place will keep the elevator shaft from internal damage during construction. This is a small look into the myriad of services that TSC Southeast provides for our clients. TSC Southeast Protects Your Elevators! Our Team Installs Elevator Guards and Curtains on Every Site! Our Elevator Curtains Provide A Guard From Debris That Occur On Site. Preventing Debris Ensures That The Integrity Of The Elevator Stays Intact! Making The Elevator Safe For The Public! Elevator protection from TSC Southeast is OSHA compliant, protects the integrity of the elevator from site debris, and keeps employees from injury by providing a barrier between the worker and the elevator shaft. If you need elevator protection for your site, TSC Southeast is the top choice. TSC Southeast is your turnkey provider of construction safety solutions in South Florida. We provide installation, maintenance, and removal of safety systems on construction sites and perform to the highest standard. If you are interested in our elevator protection systems, contact us today.